The commercial and residential construction industry is continuously evolving. A renewed understanding of how the exterior building envelope functions has generated advancements in the building code that now, more often than not, require the use of air barriers and continuous insulation. Our industry has seen this first hand; however with any challenge, comes opportunity. Whether you are a building material manufacturer, distributor, or subcontractor, you are faced with the challenge of competing in this ever-evolving industry. Perhaps the most significant controllable cost on any given project is labor cost. Smart builders know this and provide their teams with the tools and materials to get the job done, not just the right way, but also the most efficient way. Walls & Ceilings Magazine took a look at a few tangible examples specifically for air barriers, continuous insulation, and lath attachment. Air Barrier Systems: For commercial applications with challenging substrates such as steel studs and exterior gypsum sheathing, a robust fastener and tool is required. 1¾ or 2 inch diameter plastic washers, specifically designed for attaching building wrap, should be used with corrosion resistant self-drilling screws to attach the wrap while self-sealing the penetration against air leakage. To dramatically reduce labor costs, utilize screw fastening systems that use washer nose cups such as the Grip-Lok auto-feed fastening system. The nose cup holds the washer on the gun for fast, automated screw assembly and easy attachment to steel studs. This “third hand” enables the installer to move faster and safer across the wall when compared to ordinary drills that require two-handed operation (one hand on the drill while the other holds the screw and washer). Screw and Nail Assembly: For steel stud substrates, auto-feed screw gun systems with bullseye nose adaptors, collated self-drilling screws, and pronged washers should be utilized to reduce installation and labor costs. 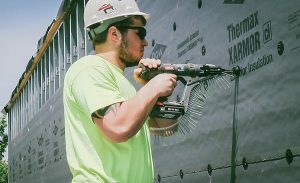 Auto-feed screw gun systems can install the screws and insulation washers four times faster than ordinary drills when attaching to steel studs.